DMV stands for Department of Motor Vehicles. They are responsible for the registration of bought vehicles such as automobiles and motorcycles—both new and used vehicles. They make use of bill of sales in order to easily keep track of all the vehicles that were bought in the local area. 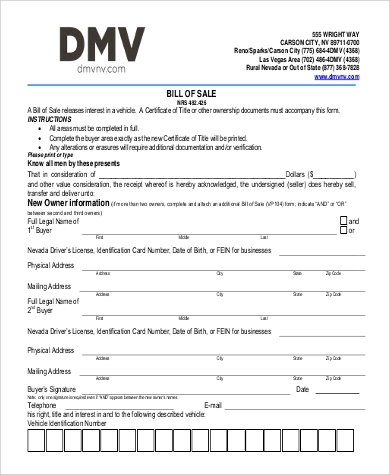 In this article, we feature six DMV Bill of Sale Samples that can be used to file or register your newly bought vehicle. These formats come in various designs, layouts, and outlines and can be used for different situation. Make sure you are able to get the buyer’s correct details such as name, address, and contact details. 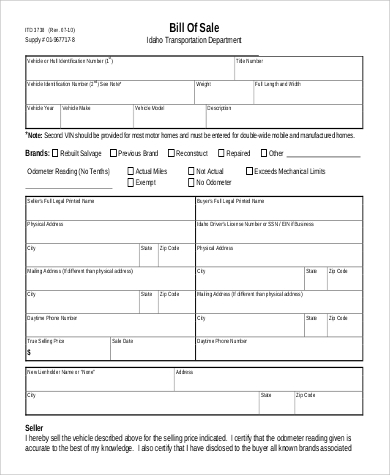 These information are needed to prove how official the transaction was. Never issue a bill of sale if the purchaser has not completed all the payments necessary to officially declare the sale transaction as complete. If you and the buyer have agreements to follow an installment plan, state it in the bill and write an agreement that the remaining amount will be paid on a specific date. 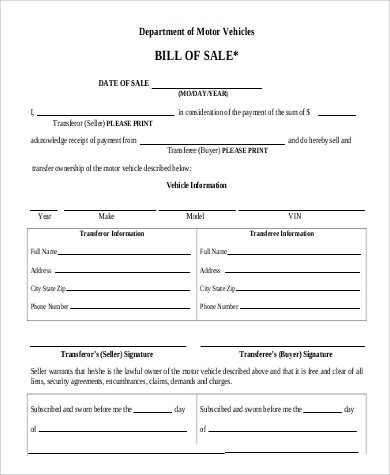 Make sure to print two bills of sale and have both copies signed by you, the seller, and one will be for the purchaser once he/she has already completed the payment of the vehicle. One copy will be given to the buyer and the other copy you will keep for documentation purposes with the local tax office and the DMV. Witnesses should also be documented in the bill of sale. Have them write their full name and affix their signature. Ensure that you submit the bill of sale to your local tax office once the transaction is complete. This is important especially when it comes to filing tax returns. 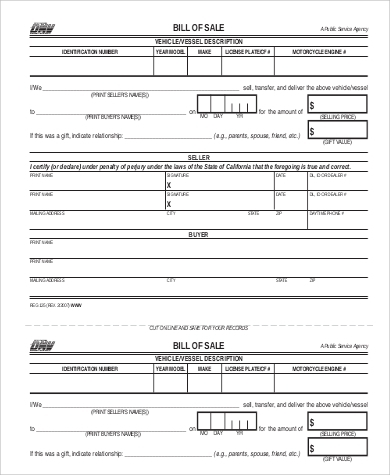 You may also want to refer to Bill of Sale Samples for Vehicle. Location. This pertains to the location of the sale. Should the situation be that the buyer is not in the same state or country as the seller, the seller’s location will be the one stated in the bill of sale. Price. The full price of the item should be mentioned. If there are any payment terms and conditions to be followed, it will also be stated in the bill of sale. Details about both parties. 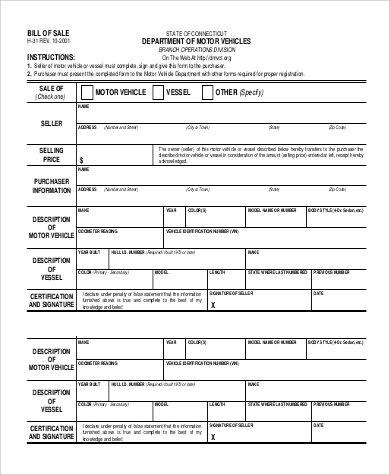 This pertains to the name, address, and contact information of the seller and the buyer. Details about the vehicle. 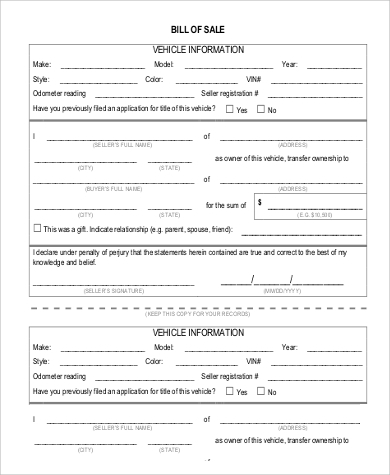 All the details that would describe the vehicle should be mentioned such as the make and model, the year of purchase, the VIN, chassis number, and the current location of the vehicle. Odometer reading. A statement pertaining to the reading in the odometer must be mentioned. It should promise that the reading is accurate and no tampering has occurred with regards to the odometer. Warranties. 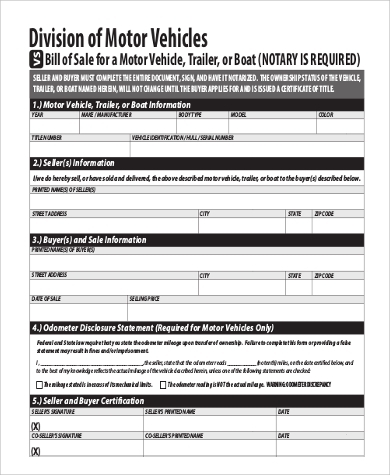 This pertains to (a) the seller’s promise that no other parties will claim ownership of the vehicle being sold and (b) that the buyer has all the right to claim new ownership of the vehicle through the sale transaction. Signature. This is highly important to be affixed to the document as this means that the deal has been sealed and all claims have been read and understood by both parties.